I am kind of a conditioner fiend. It’s been a little mission of mine for quite a while now to find a conditioner that equals the awesome little conditioner packets they give you in at home hair dying kits. If you’ve ever used one of these kits, you know what I’m talking about. That conditioner makes my hair feel so incredibly amazing and it always makes me sad when they only give me one tiny little one use packet. So I’ve been on the search for years for a conditioner that makes my hair that happy. I’ve had this Argan Oil shampoo and conditioner in stock for quite some time, but I was always skeptical to try it because of that big scary word : Oil. Why would I want to put oil in my hair? Wouldn’t that just make it oily? That’s what I always thought. Until I stumbled across a post online about natural oils that are good for your hair. The first one listed : Argan Oil. Argan oil was referred to as the ‘Miracle Oil’ and they listed several benefits of it such as a natural sunscreen, heat protectant, intensive repair treatment, improving elasticity in brittle hair, reducing frizziness, repairing damage, reducing future breakage, and helping hair growth. Now, plenty of conditioners claim to do these things, but I had always stuck to brands like Tresemme or Aussie and nothing that said anything about oil. After I had read about Argan oil, I was very much considering buying a bottle. I finally made up my mind when my cousin mentioned liking her new Argan oil conditioner. So I finally bought the Delon conditioner with Argan Oil. I started off reading the bottle and saw that this product is not tested on animals, which I really liked. After my first use, I was in love. I think everybody knows the amazing silky feeling that your hair gets when you are rinsing out your conditioner. Sometimes it’s silkier than others, depending on what conditioner you use. The silkiest I have ever felt it was after using the conditioner from hair dying kits. Until Delon. After shampooing, I coated my hair with conditioner, focusing on my roots. I left it on for about two, maybe three, minutes while I shaved and washed. Then came the moment of truth, rinsing it out. As I was rinsing, I actually ‘Ohh’ed over the way my hair felt. I was definitely satisfied. 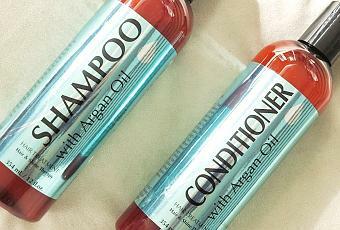 I found Delon shampoo and conditioner with Argan Oil online from 6.99 – 11.29 per bottle. But you can get 12 ounce bottles of Delon shampoo and conditioner with Argan Oil at Manteca Grocery Outlet for only 3.99 per bottle. That’s a pretty good deal if you ask me!